On Monday, a dear friend was hospitalized for nobody-was-quite-certain-what, which meant that in between juggling my bereaved friend and Buddy, I was dashing over to the hospital with soup and other goodies (since the hospital was doing its damnedest to uphold the reputation of hospital food as unpalatable and disgusting). Maybe it was this line that reminded me of a pair of books I knew and loved in childhood. Karen was about a child with cerebral palsy. Her mother authored the book, and her entire family became involved in working on behalf of people with cerebral palsy. In the sequel, With Love from Karen, Karen’s mother told of Karen’s adolescence and emergence into young adulthood. This line reverberated in my head all week, but it did not bring me comfort. I thought of it as I coaxed Buddy to eat, as I syringe-fed him, as I steadied him when he sneezed and nearly knocked himself over. I didn’t feel as blessed at this pain, this struggle, this gritty departure from life, as this young girl apparently had. I felt bombarded with one crisis after another. I felt angry. Furious. Betrayed. The internal medicine consult had resulted in a diagnosis of “probable lymphoma,” and we’d set up a regime of medications with the expectation that if he didn’t get into remission, we would have six to twelve months. Instead, he’d embarked on a downward trajectory no one saw coming so that a mere three weeks after the GI panel and the endoscopy and the biopsies, when he’d barely begun chemo, the end was upon us. I clung to hope. I tried to tell myself that I wasn’t seeing what I was seeing, that this was simply a tough reaction to the beginning of chemo and that things would level off, that he would settle in and feel better. I denied the evidence of my eyes, my ears as I heard him fall over, my hands as I felt each vertebrae, blaming the meds. Thursday morning, I woke when Buddy attempted his usual slide off the bed. As a blind cat, he was hesitant to get down from most spots, but the bed was one of the few high-ish places from which he would disembark on his own. I tried to get him to use the steps at the foot of the bed, but he liked to slide his paws down the side until he felt comfortable that he was near the floor. This time, before I could stop him, he started down the side and tumbled to the floor, his now-tiny bony self clattering on the bedside rug. He righted himself and tried to walk, and he walked headlong into the door he knew was there. Far from his usual Roomba-style of walking—glancing off one wall, then the other—he was clearly disoriented. I scooped him up and took him to what I knew to be his destination, his water dish in the bathroom a few feet away. I set him by the water dish and splashed my fingers in it which, until yesterday, had been his cue to drink from the dish. He sat like an elegant black statute, unmoving. I refused to admit defeat. I lifted him to the vanity, where Olivia’s fountain constantly splashed water into the bowl. He couldn’t get himself up there, so for a long time, he had no idea it was there. When I introduced it to him two weeks earlier, he found it delightful, drinking for three or four minutes straight, caring not a whit for the stream pouring down his face as he drank from the bowl. Yesterday, he’d merely licked the wet plastic, showing no interest in the water. I scooped him up and cuddled him, trying my best to deny the obvious. I’d had to syringe-feed him the day before—this, for the cat who had been like a heat-seeking missile when it came to stealing other cats’ food. He refused bits of cooked chicken, his most dearly-cherished snack. I’d emailed with the internal medicine vet a few days earlier, and she’d said that chemo could affect appetite, which was why I’d even tried with the syringe: I wanted it to be a temporary measure until his appetite returned. I told myself I wasn’t seeing what I was seeing. In a last-ditch effort to blame the meds that Thursday morning, I called the veterinary hospital. When they asked, as always, if this was an emergency or could I hold, I said, “I don’t know,” and my voice broke. I told the girl what was going on and how we already had a follow-up appointment for next Tuesday, but could we possibly see our internal medicine vet today instead? She told me to bring him in through the ER, and she’d alert the internal medicine team that we were coming. I knew what he was saying. “I need to know I’m not doing it too soon,” I said, as if there was a chance he would tell me to wait. He shook his head. “Today would be an appropriate day.” When I pressed, he admitted that he couldn’t say whether Buddy would last through the weekend. I bundled Buddy back into his carrier. In the car, I called my friend in the hospital to tell him the day had arrived. I called Lucy and Gordon, the friends who have long provided cat care in my absence, to offer the chance to say goodbye. Then, I called my regular vet and asked if he would have time this afternoon, because I needed those last few hours. When we returned home, I laid Buddy on my bed and got in next to him. I stroked him and talked to him, telling him what a good boy he was and how much I loved him. Around midday, Lucy and Gordon arrived, and we all cuddled on the bed with him, and Lucy whispered in his ear that when he got to the Rainbow Bridge, he should find her cats and give them a message from her that I couldn’t hear. I spent much of the afternoon next to him, reading Gwen Cooper’s account of when she had to put her blind black cat, Homer, to sleep. I tried to get Buddy to drink, and when he wouldn’t, I squirted water into his mouth with the syringe, just to moisten his mouth. We dozed together. At one point, he wanted to get up. I put him on the floor and steadied him as he walked to the bathroom. He didn’t angle toward the water dish, and so I guessed that what he sought was the litter box. I was right. Always the gentleman, he would not allow for a mess even in his final hours. Finally—too soon—the designated moment arrived. As always, everyone at the vet’s office was gentle and compassionate. No other patients were present. The room had been set up, the examining table covered with a thick cream-colored blanket; a box of tissues sat at the edge. I held Buddy while the sedative was administered, and the vet and the tech left the room while we said goodbye. He grew heavier in my arms—he, who weighed 19 pounds three years earlier, but a mere 8.4 less than a week before that day. After a respectful time, they came back in, and I laid him on the blanket so they could shave his inner leg and inject the final drug. I bent over him, whispering what I always told him: “Mama loves Buddy. Mama loves Buddy.” Even after the vet laid a stethoscope on his chest and said, “He’s passed,” I kept repeating the words into his ears, just in case. Eventually, I forced myself to step back, to let the tech wrap him in the blanket just as if she was going to lay him in a bed. I had enough clarity of thought to know I couldn’t do anything, so I stopped for takeout at a shop I’d frequented during the fire era. While my order was being prepared, I went to the liquor store next door. Both times, as I left, the person behind the counter said brightly, “Have a good evening!” Those well-meaning words had never before felt like an assault. Two days have passed. Buddy wasn’t a noisy cat, but the house is silent without him. The other four cats seem like a tiny group. The first night, I picked up the water dish from the bathroom, but it took until Saturday to put the water syringe back in the kitchen. The placemat he’d used for his food dishes was undeniably the ugliest placemat I’ve ever seen—I bought it for a dollar because he needed something I could wipe easily and yet not trip over—but I can’t throw it away. Instead, it’s propped against the work cart he ate in front of, and Olivia occasionally rubs her face on it. Ned, who was Buddy’s closest kitty pal, has taken to occupying the basket next to my recliner that was Buddy’s regular spot, although he never slept there during Buddy’s life. The fanciful part of me wants to believe that Ned knows how often I would be sitting in the chair and reach down to touch Buddy, and he doesn’t want me to reach down and find no one there. Yesterday was Good Friday. It was gray, drizzly, grim. I kept a lunch reservation I’d made on Wednesday with a friend who’d had to cancel. When the waiter asked how I was doing, I said, “Not well.” He said something about the day brightening, and I said, without bitterness, “That’s not going to happen.” After that, he toned down his sparkle, clearly at a bit of a loss for how to deal with a customer who is simply sad. I drank enough at lunch that I spent much of the afternoon napping. I was awakened by a call from my computer repair person. When we hung up, I realized I just had time to make it to the Good Friday service, which fit my mood, my heart, my soul. I slipped into the service late and out at the end without speaking to anyone, which also fit. Tomorrow is Easter. People will be bright and festive, dressed in pastels and hats with flowers. Everyone will rejoice: Death is conquered! Christ is risen! I want to respond, But Buddy is still dead. So is my friend. This is not to undermine the significance of Christ’s resurrection from the dead. It is simply to say that this year, for me, three days is not enough time to move from darkness to light. Maybe I’m not as spiritual as this adolescent girl. I’m certain she didn’t respond to her dog’s death by drinking too much wine, eating chocolate, and facing chirpy “Have a good day!” well-wishers with a stony glare and silence. She probably greeted Easter morning with a determined and triumphant “Alleluia!” as she donned her springtime best to celebrate the high point of the liturgical calendar. But as I sit here on Easter Eve, I find myself thinking that the apostles were in a very different place: nobody expected them to be brave and perky. Their world had been destroyed. The Messiah had been murdered. They likely feared for their lives. Nobody said to them, “Aren’t you lucky to have shared in His suffering?” They had the peculiar luxury of being free to grieve without anyone expecting them to buck up because things were going to get better. I know Easter is true. Tonight, I’m just not ready to say so. To own it. Fortunately, it will still be true when I finally reach that place. 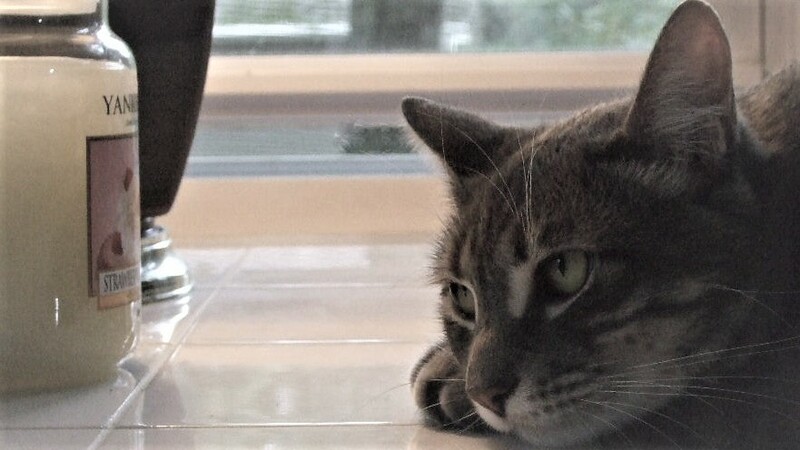 This entry was posted in Things I have learned so far, Uncategorized and tagged cats, death, dying, Easter, Good Friday, grief, Gwen Cooper, Holy Week, Homer's Odyssey, Jesus Christ, Karen Killilea, lymphoma, pets, Protectors of Animals, Rainbow Bridge. Bookmark the permalink. I read this with tears, as it hit very close to home. I went through something very similar with my Buddy three years ago. He was also blind, had beautiful black hair — and cancer. I’m so sorry for your loss, PJB. It’s no small thing, but time and the busyness of life will eventually crowd that big empty space into a corner where it won’t be so daunting. Take care. I had a Buddy too, Jo, but he was a dog. I lost him four years ago. It’s so hard to lose part of the family. Indeed they are family. Sometimes the best part. Thank you for your kind words, JC. I’m so sorry your Buddy has also left you, and I trust the wisdom of your experience. My Buddy was a dog, too. Like Pat said, part of the family. So sorry to hear about Buddy, and the rest of your trials this week. A rough one for sure.